Reports of unauthorized dredging taking place within the Hol Chan Marine Reserve Expansion Zone on the west coast of Northern Ambergris Caye, have prompted local authorities on the island to issue an immediate stop order. This is the second time the activity is being reported, and on Tuesday, July 11th, the Hol Chan Marine Reserve filed a formal complaint to the Mining Unit in the Ministry of Natural Resources. As such, personnel from the Mining Unit are planning a visit to the island to conduct a site inspection. According to them, the company responsible for the unauthorized activity may face penalties, depending on the extent of the damage caused by the dredging. The Mining Unit has once again indicated that no permit has been granted for such activity and that the company exercising will be served with an official document to cease operations for good in that area. Working along with the Department of Environment, they will be heading to Ambergris Caye with a team in order to assess the dredging situation. A date for the visit has not been arranged. 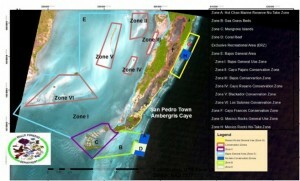 The Mining Unit maintains that it is illegal to do dredging within marine protected areas. They encourage the general public to report any such activities whenever they see these happening near a marine reserve. The Mining Unit can be reached at 802-2328 during normal working hours Monday to Friday.